Wm. Glen & Son was established in 1869 as a quality ladies and gents clothier in Callander, Scotland, and grew into one of Scotland's leading Highland Outfitters. In the 1990s, Wm. Glen acquired the Hector Russell Kiltmaker Group of companies. Now, independent again after selling off the Hector Russell name, Wm.Glen & Son remains committed to bringing you the best Scotland has to offer. We also have stores in Drumnadrochit (Loch Ness), Scotland and in Toronto, Canada. 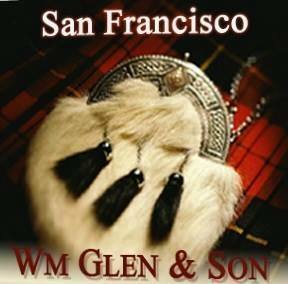 Our store in San Francisco specializes in kilt outfitting, and includes a large variety of imports from Scotland, such as woolen and cashmere sweaters, tweed sport coats, jewelry, pewter ware, tartan and clan goods. We also carry many souvenirs from Scotland, as well as perhaps the largest single malt whisky collection in the United States.